The home buying and selling process is no walk in the park. Sometimes a few white lies are okay to help ease clients and leads. This list is not true for all agents and is intended to make you laugh. Enjoy this list of ten ridiculous fibs Real Estate agents tell their clients and leads. 1. Lie: I am the only agent using the internet in this town. Truth: I am not the only agent with internet access, but I am setting the bar with my high ranking website, IDX home search sites, and strong social media presence. 2. Lie: An open house is the only way to get your home sold. Truth: There are definitely pros and cons to having an open house, and it's in your best interest to show this house. 3. Lie: I am so happy you are taking initiative to estimate your home value! Truth: I prefer you leave the home pricing to the expert (as you hired me for a reason). We all know tools like Zillow Zestimate and Trulia Home Values can give sellers unrealistic expectations. 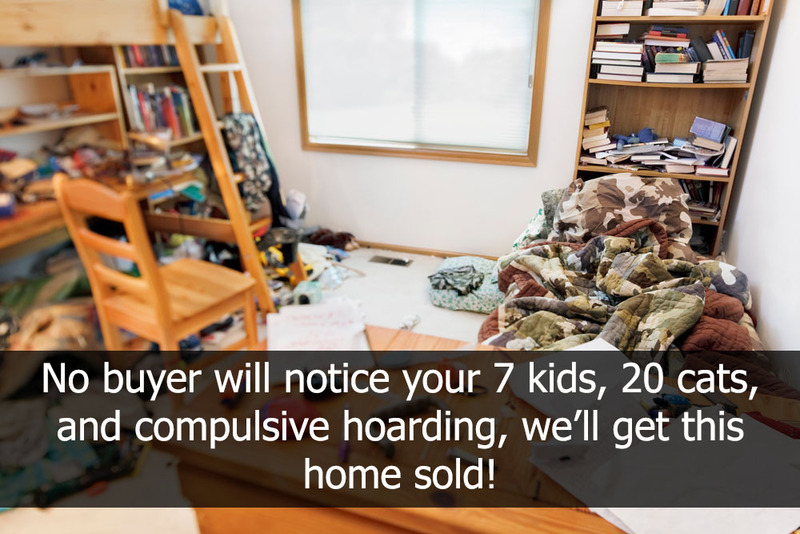 Truth: Your going to need some serious home staging before I can show your home. 5. Lie: I know of __ listings in that price range! Truth: That price range is reasonable. I don’t have listings that fit your exact needs, but am confident in my ability to find listings that do. 6. Lie: They’ve already got __ buyers lined up. Truth: I know they have at least one buyer lined up and am urging you to act quickly in your own best interest as this is a hot buy. 7. Lie: I know of a great home inspector. Truth: Many home inspectors have established relationships with listing agents and may be biased towards them. 8. Lie: I have sold homes within is this price range in the past. Truth: I have sold a few homes close to this price range and am confident in my ability to sell yours. Truth: Most agents usually don’t know all of the zoning ordinances off the top of their head and will need to follow up later. 10. Lie: Those other brokers charge a special per transaction fee/Realtor fee/etc. Truth: Not all brokerages operate the same. If agents were upfront with clients in the beginning they may lose the deal if they don't provide reason for the costs.